Enjoy working outside, gardening, working with animals? We have many volunteer opportunities available for all abilities and can work around any schedule. 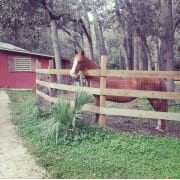 We are a non-profit specializing in helping people with challenges with unique therapies and programs centered around our animals and nature, and are looking for people willing to help us in maintaining the grounds, caring for our animals, working in our community garden, and many other tasks. Opportunities available for all ages and group sizes. More opportunities with Nature's Place Therapy Services, Inc.